The Heritage at Fox Run wanted to do something to help Council Bluffs police officers and Council Bluffs firefighters in their quest to donate hundreds of household items to Boys Town Iowa. Lacy Jungman, director of sales and marketing for Heritage, said working with the community was the best solution. 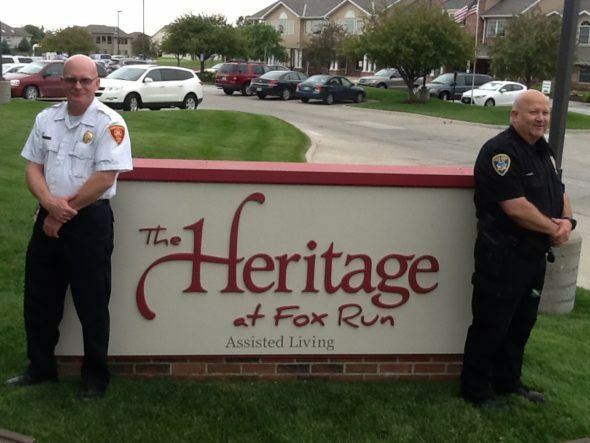 All this week, anyone who tours the assisted living facility can decide whether the Council Bluffs Police Department or Council Bluffs Fire Department gets $10 worth of household goods, purchased by Heritage at Fox Run for an ongoing competition between the departments. In June, the two agencies are collecting household goods, such as cleaning supplies and hygienic products, for Boys Town Iowa. Boys Town Iowa helps families in 30 western Iowa counties, but the contest between the police and fire departments, called the Boys Town Iowa Drive, will make life easier for Council Bluffs families, said Debbie Orduna, director of Iowa operations. Boys Town Iowa officials will name the winner of the contest and the amount of household goods collected on July 1. Each department has six collection boxes located throughout Council Bluffs at the police station, fire department stations, local Hy-Vee grocery stores, Hy-Vee Drug Store and The Center on South Main Street. Jungman said Heritage supports all three agencies (CBRD, CBFD, Boys Town Iowa) in the competition, so it made sense to help out. The Heritage at Fox Run is always looking for opportunities to give back to the community,î Jungman said. ìJust as we wouldnít want our elderly to choose between paying bills and necessary staples, we certainly donít want others, including families with young children, to have to make that choice. Jungman said there are many similarities between the elderly and children. At times, we see seniors who are struggling to provide those same staples for themselves. Both generations are vulnerable age groups, and we felt it was a necessary gesture to give back. Jungman said Heritage spoke with Boys Town Iowa and the CBPD and CBFD and everyone was very excited for their help. Our hope is that we get a flood of people in our doors, and make a positive impact in the lives of families and children through our donations,î she said. ìWe are prepared for the Council Bluffs public to tour the community next week. Click here to see the original article in the Daily Nonpareil.